A new idea struck me, summarised below. No crystal structure of a mauveine has ever been reported, and so the position of the N-H groups is not determined. It is normally drawn as tautomer 1, but what about tautomers 2-4? Following the principle of completeness, it is important to include a counterion. And because the colour mauve is recorded in methanol solutions (i.e. it is unlikely to be due to aggregation), we will include some explicit solvent (water) as well. To illustrate the model, I show the geometries calculated for two counter-ion isomers of tautomer 4 using ωB97XD/6-311G(d,p)/SCRF=water. Tautomer 4. Click for 3D. 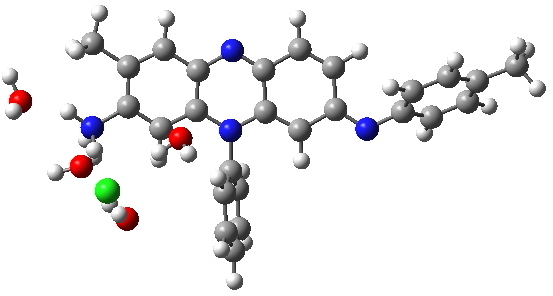 Tautomer 4, with different arrangement of Chloride. Click for 3D. 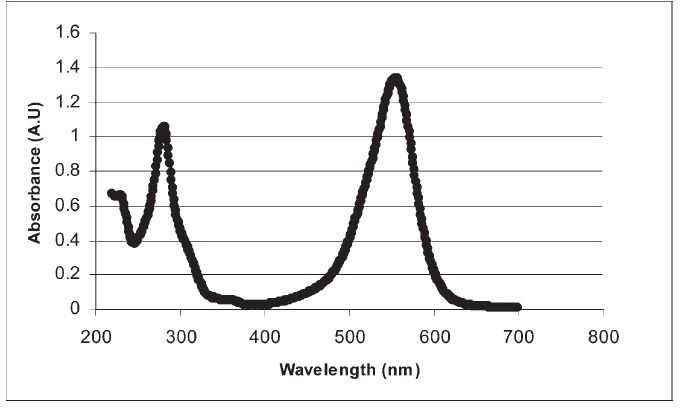 The predicted UV/Visible spectra are shown below (ωB97XD/6-311++G(d,p)/SCRF=water model), and λmax ranges from 440 to 655nm simply by moving one proton around! The spectrum that matches the measured best corresponds to tautomer 4. Unfortunately, it is calculated to be about 15 kcal/mol higher in energy than tautomer 1, which is the lowest in energy. So one step forward, and one back. A better colour match can be obtained by modelling a different tautomer of mauveine, but this now leaves the energy unexplained. I think perhaps a determined effort to get mauveine itself to form good crystals and to analyse those to confirm where the three exchangeable hydrogens reside would be well worth the effort. Even then, that will not necessarily tell us what is happening in solution. Such an old, and famous molecule, and still there is a mystery. This entry was posted on Wednesday, October 26th, 2011 at 4:14 pm and is filed under Uncategorized. You can follow any responses to this entry through the RSS 2.0 feed. You can leave a response, or trackback from your own site. 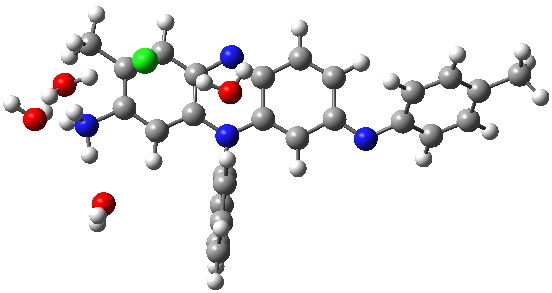 In a recent article, Plater MJ, “A synthesis of pseudo-mauveine and a homologue”, J. Chemical Research, 2011, 35, 304-309. 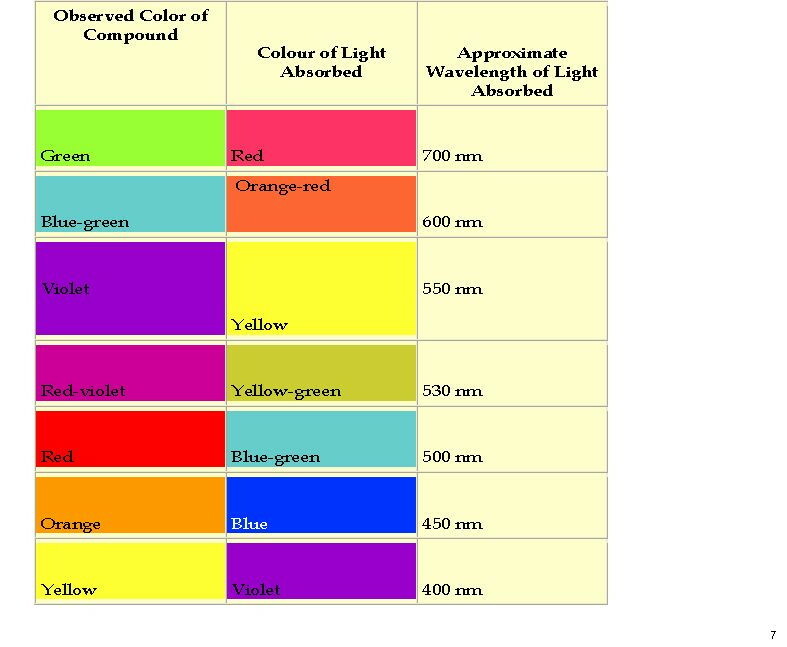 DOI: 10.3184/174751911X13052165053977 reports the whole spectrum of mauveine A, which I reproduce here. 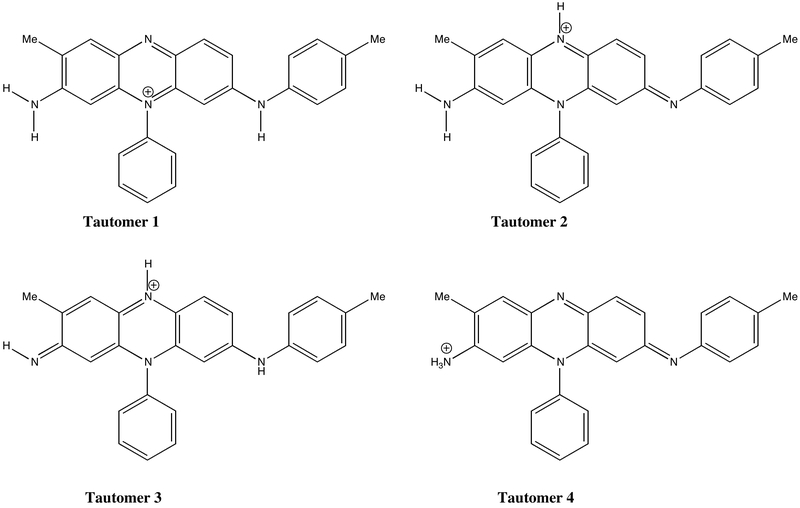 The region 230-300 certainly matches tautomer 4 slightly better than tautomer 1 (bearing in mind that shifts of about 10-20 nm are commonly applied to such spectra, these being fairly typical corrections). The intensities, particularly at low wavelength are often less well simulated. I am gradually checking out sources of error in these calculations. Recent posts to the CCL list comment on some of these errors. Some think that the TDDFT method is fine for relatively unconjugated systems, but once the conjugation becomes highly extended, the method fails. For those systems, TDHF is suggested as an alternative. The TDHF spectrum for mauveine is shown below. λmax is around 400nm, no improvement on the model. In this and previous posts I wondered why TD-DFT methods were predicting the absorption max for mauveines to be ~380nm, rather than the observed mauve colour of ~550nm. This aspect was addressed in a recent article on the topic (doi: 10.3184/174751915X14474318419130) which broadly indicated that DFT methods can be enormously variable in terms of their UV-Vis predictions. However, attending the Schleyer symposium in Erglangen, Rainer Herges noted that the TSSPh functional (not one I had previously investigated) was giving very good results for porphyrin compounds. So I gave mauveine a go using this functional, with the result shown below.